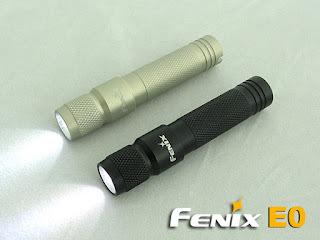 The Fenix E0 affectionly known as "Dart" is a single cell AAA flashlight powering a 5mm Nichia LED. The flashlight is designed for runtime and usability and not to be a bright white wall hunter. The flashlight is extremely small and suitable for keychain carry, barely bigger than the AAA cell that uses, the twist is a simple twist on/off switch the neck of the light having a protuberance that helps the on/off mechanism and the switch, being construced with HA-II aluminium the "Dart" can be kept with keys and other items without damaging the light, it will resist impacts and scratches and it is water resistant using o-rings for sealing. The light can stand on its tail and be used in candle mode for room illumination. In the box it comes with a split ring, a lobster clip and some spare orings. The light is powered by a single AAA battery and can use alkaline, rechargeable or lithium cells. It has a circuit to regulate the output so it will offer aproximately 9 hours of fully regulated light followed by about 11 hours of a dimmer moon mode so the total runtime with a single cell is aproximately 20 hours. The flashlight is not bright, but is designed for runtime and not for brightness. Comparing it wiht the Arc AAA-P the E0 is dimmer and bigger but the cost is exactly a half so it becomes a serious competitor. It doesn't come with a pocket clip but you can order one for $2 from Lighthound. If what you want is a keychain light that has good runtime without caring for the brightness then the "Dart" is a very good deal for the money, you have more expensive premium options and brighter options but this is a value for the money deal to consider. You can order from Fenix-Store or Lighthound for $20. This is a small accesory for AA or AAA Mini Maglite flashlights. It consists of 20 inches of flexible 3mm fiber optic cable and a flexible plastic cap for the flashlight bezel. 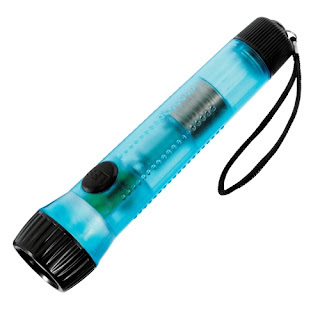 The cap is attached to the flashlight and the fiber optics transmits the light to the tip of the wand allowing you to reach difficult areas where a complete flashlight is not easy to handle. The wand is flexible so you can shape it to reach places that require some twists or turns. Flexibility is limited because the fiber optic is fragile. Since the mini maglite is focusable changing the focus will change the amount of light that is conducted by the fiber optics and will allow variable brightness at the end of the tip. You can read more information at niteize website and you can get it for $11 form Lighthound. A shake-light is a flashlight that doesn't need batteries to work it is activated by a shaking mechanism that charges a capacitor inside the light, you shake it for some seconds and get light for several minutes, never needing batteries or any power source. Shake lights have become popular as novelty items and toys. 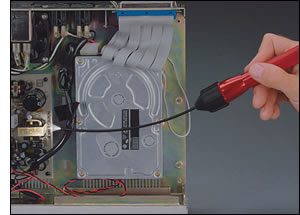 Unfortunately many of the shakelights being sold at retail stores are fakes, meaning that they are really powered by some coin cell batteries and the shaking mechanism do little or nothing. This is one of the real shake-lights it uses a LED light and it is charged shaking the light making a magnet inside the light move back and forth charging a capacitor. After 2 minutes of shaking you can get light for about 30 minutes. The body is water resistand and floats, the plastic is a good one but will probably be damaged if the light falls on a sharp rock or gets crushed. The flashlight is not bright but shakelights are not characterized because of their bright beams the good thing about them is that they don't need batteries so they are a very good backup light and emergency light, you can keep some of them in different places and have a flashlight available (after some shakes) whenever you need it, the storage time is almost unlimited. You can order this model for $10 following this link.